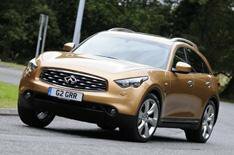 Infiniti FX: driven | What Car? Mention 'Infiniti' to the average British car buyer and chances are they won't have a clue what you're on about. Well, if anything's going to draw attention to the UK's newest brand, it's the striking new FX. Everything about it screams 'look at me' the massive alloys, the curvy bodywork, the beefy twin exhausts even the swanky grille was modelled on a ring made by Gucci. You can't get much more bling than that. It has attention-grabbing performance, too, thanks to the two petrol engines on offer a 316bhp 3.7 V6 or a 385bhp 5.0 V8. Both make this two-tonne car indecently fast, and both work well with their seven-speed automatic gearbox. Is it any good to drive and own? The FX also handles reasonably well for a big car. Okay, it doesn't have the agility of a BMW X6, but there's decent body control and quick steering. However, the ride feels decidedly lumpy, and you hear plenty of road noise, especially if you go for the versions with gargantuan 21-inch alloys. There are other issues. Some of the cabin materials aren't befitting of a luxury SUV, and despite its vast proportions, cabin space is surprisingly tight. It'll cost you a fortune to run, too, not least because resale values are weak for the class. Still, the FX comes stuffed with kit. All versions have electric leather seats that are heated and ventilated, six airbags, stability and cruise controls, an electric sunroof and a multimedia system with more functions than you can count.